Nothing beats hanging out in a sweet basement: you're undisturbed, there's no distracting sunlight, and cleanup's easy, what with the only rugs down there being in dad's magazines. Continuing the proud, subterranean tradition: Jake's Boiler Room. 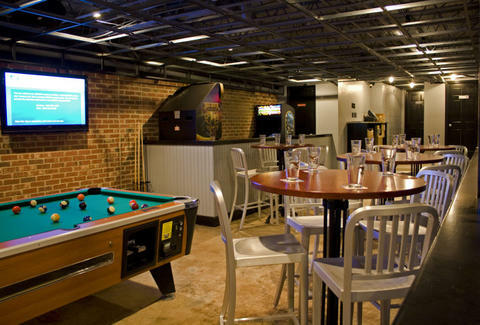 Concrete and neon-signed, the just-opening Boiler Room below Jake's American Grill is armed with arcade games, a 15-person cement bar, and eight LCDs presumably blasting guy stuff like football, and... MANswers? Prove your hot-shot, basement-besting skills on a tournament-length pool table, Xbox Kinect (aka So You Think You Can Dance...In A Basement, In Accordance With The Steps On Screen? ), and classic arcades like Golden Tee, Buck Hunter, and a Mega Touch replete with nudie Photo Hunt. In addition to the 20 drafts (Delirium Noel/ Avery White Rascal/ Magic Hat Howl) piped down from upstairs, the BR'll keep you occupied with Monday night trivia, Wednesday night karaoke ($4 drafts! ), and a Thursday night dart league, which is sort of like the Justice League, in that darts are arguably as effective as that one guy with the arrows. In case you hate meeting new people, you can also rent the room for an up-to-100-person private party; just remember this is a basement, so unless you bring a copy of Dad's Strawberry Sweethearts, don't expect a red carpet or anything.